Lafayette County, Mississippi, was the primary inspiration for what is arguably the most famous place in American fiction: William Faulkner's Yoknapatawpha County. 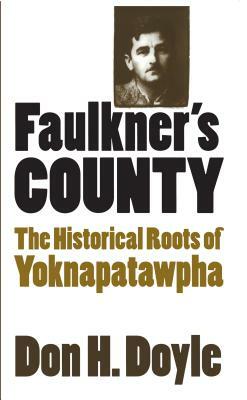 Faulkner once explained that in his Yoknapatawpha stories he "sublimated the actual into the apocryphal." This history of Lafayette County reverses that notion, using Faulkner's rich fictional portrait of a place and its people to illuminate the past. From the arrival of Europeans in Chickasaw Indian territory in 1540 to Faulkner's death in 1962, Don Doyle chronicles more than four centuries of local history. He traces the building of a permanent community and plantation economy by white settlers, the lives of slaves in the region, the experiences of secession, Civil War, and Reconstruction, town life in Oxford, and the "Revolt of the Rednecks" Faulkner captured in his saga of the Snopes clan. Drawing on both history and literature, Doyle renders a rich and deeply researched portrait of Faulkner's home. "Yoknapatawpha was a place of the imagination, invented by Faulkner as a vehicle for developing a coherent body of fiction," Doyle writes, "but the raw materials from which he created this place and its people lay right at his front porch."